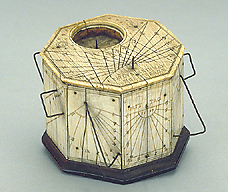 This polyhedral dial is made from an octagonal block of wood, covered with layers of ivory. It has a pin gnomon dial on the top and on one of the faces, and unusual wire dials on the other seven faces. All the wire dials are quite simple and indicate common hours for different parts of the day. The date 1441 on the top is probably a later addition, since the style of the numerals is characteristic of a later date. Another date, on one of the faces, 1597, is more consistent with the style of the instrument.